“This takes away my right to hire or fire whatever company I choose to do business with,” Chris Green, a Maplewood resident, told council members. Several other speakers said an organized trash collection system would strip them of their personal freedom, limit free enterprise, affect small businesses and affect the quality of their trash service. A handful also spoke in favor of an organized trash collection system. The city began looking into the issue most recently about a year ago after Maplewood’s Environmental and Natural Resource Commission identified it as a top priority in 2009, according to Shann Finwall, environmental planner for Maplewood. Through its initial study, Finwall said, Maplewood learned an organized trash system could end up saving money for residents because of the city’s ability to buy the services of private trash haulers in bulk. In addition, Finwall said organized hauling would mean fewer garbage trucks on city streets, which could be better for road maintenance and reduce pollution. She added that a state statute required the city to pass Monday’s resolution before it could further study the reach of those potential benefits or learn more about any possible downsides. There is always a trade-off between centralization and decentralization. That some people make it a religious argument always puzzles me. If it is more efficient to have one large trash can in the kitchen than 20 small ones, then I will have one large one. If it is more efficient to have one can in the kitchen than to keep it outside with the final trash, that too is a savings, where I can combine (and thus reduce) my trips to the dumpster. That is an economy of scale (the increased distance in my within-kitchen travel is outweighed (or not) by my lowered collection costs when the trash is finally taken outside). In that case, I receive the benefits and costs of either alternative, so I internalize any potential externalities. The answer is empirical, not religious, not improved by proving Godwin’s Law. Perhaps the residents do not trust their community to do the analysis, but that is a different problem. I believe however, as I said in my recent post on recycling: You have to keep them separated, that the balance needs to include both individual and public costs, and including one to the exclusion of the other is likely to be inefficient overall. 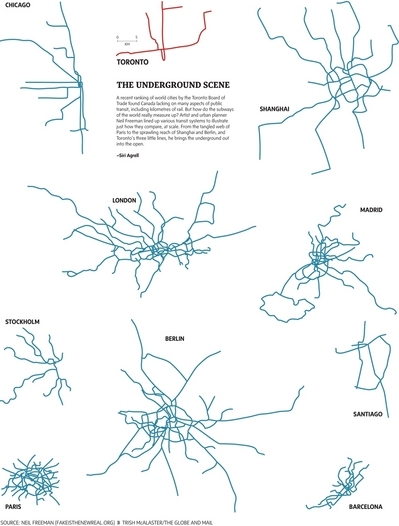 How do the transit systems of the world really compare?